I know it doesn’t bear thinking about the C word right now, but today I wanted to throw back to one of my favourite projects to date; a giant Christmassy gingerbread replica of Castle Howard. And when I say giant, I do mean giant – it was over 3 and a half metres wide, and 2 and a half metres deep! In the end, I made 8 gingerbread buildings: Castle Howard, the Ray Wood Reservoir, Temple of the Four Winds, Mausoleum, Carmirre Gate, Carlisle’s Obelisk, the train station, and the Earl’s Monument. The top of the Earl’s Monument is a highly detailed gold filigree piece – it was so fiddly (and with a four and a half hour journey, nerve-wracking) but a fun challenge! I started with reference images for each of these buildings, to begin the process of working out how to make each one in gingerbread format. 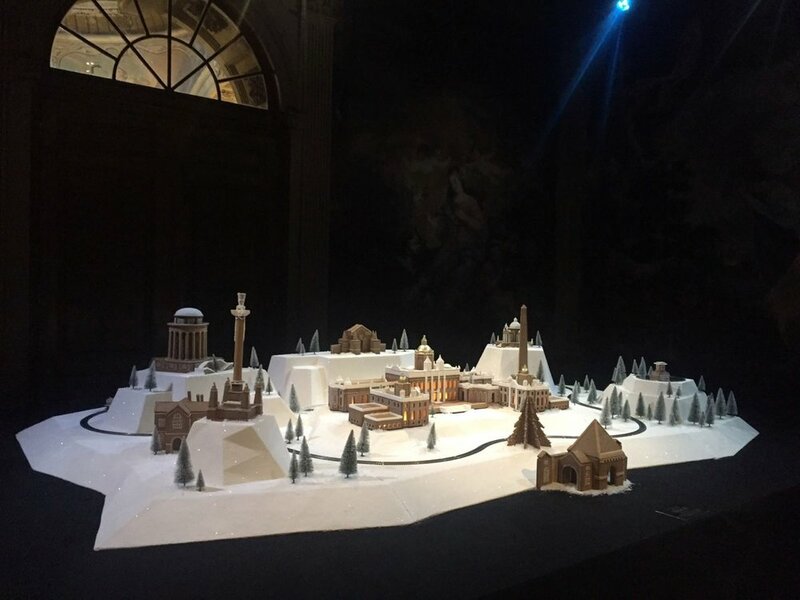 Once I’d worked out the template, I made it from cardboard and assembled it to ensure it was structurally sound (I didn’t want to be the one responsible for destroying Castle Howard now, did I?). After that, I used the cardboard templates to build the gingerbread versions. To retain the fine, delicate details of the buildings, I also used icing and pastillage (a kind of super-strong, super-thin, porcelain-like icing) to decorate. As the main house was going to have interior lighting, we also had proper window detailing in there. Now, I know what you’re thinking – I’m based in Hackney, and Castle Howard is in York. Was that not the most nerve-wracking install ever? And the answer, my friends, is yes, yes it was. After 2 months of designing and making everything, I then had to drive the buildings up to Yorkshire to install (that’s a four and a half hour drive each way!). Once there, I worked with Bompas & Parr on the install, as they’d created the landscaping that the gingerbread was to sit on. It took three of us just to carry the main house in, and I had to take lots of spares of every component in case stuff broke! In the end though, it arrived in perfect condition. 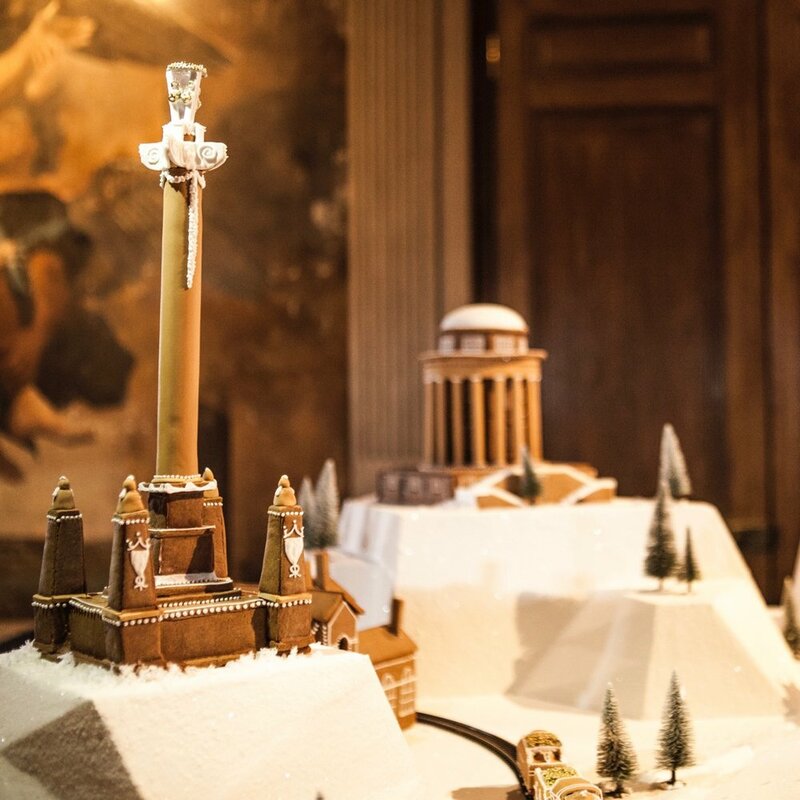 Once set up, the gingerbread Castle Howard was displayed for month in the lead up to Christmas 2016. It’s one of the many things I love about gingerbread– and believe me, there are many – but once it’s there, it stays there! 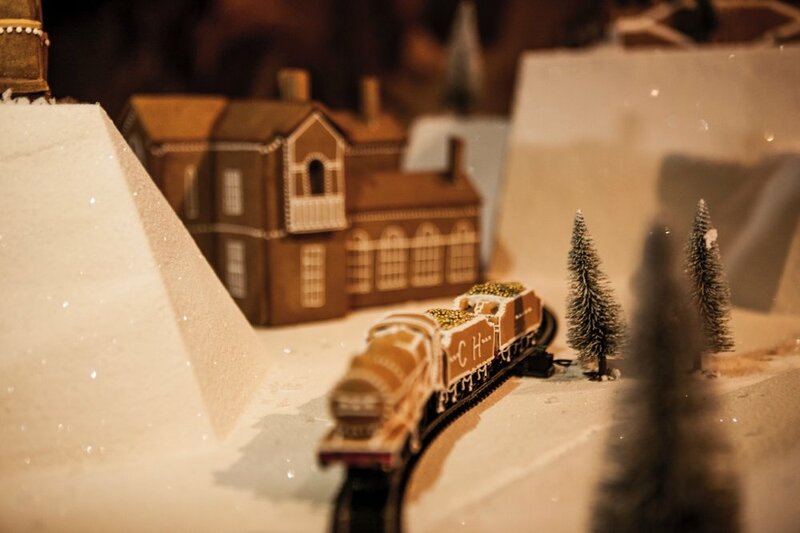 Do you fancy a large scale build or event centrepiece made entirely from gingerbread? If you do, get in touch with me here - I’d love to hear from you!